A roping dummy is great for practice. A dummy is less expensive than live cattle, never outgrows its job (requiring it to be sold and replaced), and doesn't require additional costs like shelter, fencing, feed, or medical care. Below are roping dummies for sale on eBay and Amazon. Some of them are steer and calf heads, while others are more "full size" dummies, like the Something Dummy. 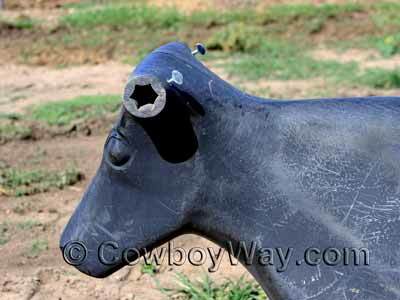 Below: A plastic steer head roping dummy. It has two black spikes on the back designed for sticking into a bale of hay or straw as shown in the photo. 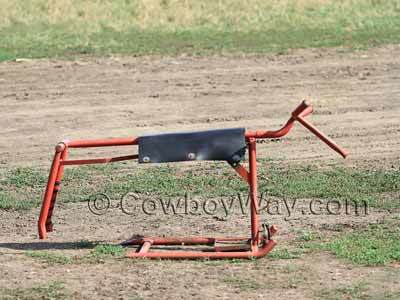 When shopping for a roping dummy there is no such thing as a standard roping dummy for sale. 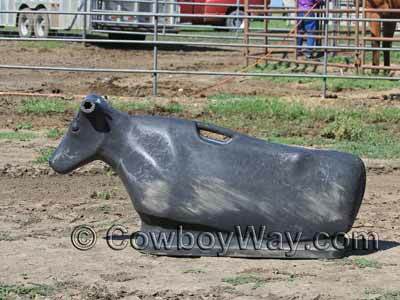 Dummies can be designed for calf roping or team roping, or used for practice for roping in the pasture. They can be small and simple (like a plastic steer head) or larger and with handy options (like changeable horns for practice on different sizes) like the Something Roping Dummy. Below: A black Something Dummy with the horns removed. The Something Dummy has different sizes of horns that can be switched, or it can be roped without horns. Below: A close up look at the head of the Something Dummy shown above. 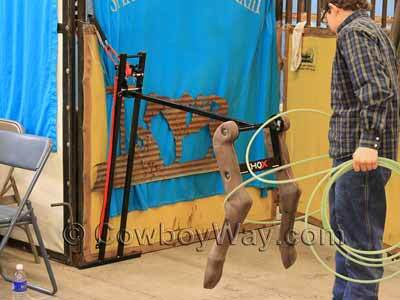 Below: A roping dummy that can be used for stationary practice or dragged for moving practice. Most dummies are also easily portable, designed to be moved around the barn area, thrown into the back of a pickup or car, or put into the trailer with little difficulty and without taking up too much room. A portable dummy means a roping practice area is portable, too, increasing a roper's opportunities to get in practice time. Below: A roping dummy for practicing heel catches. 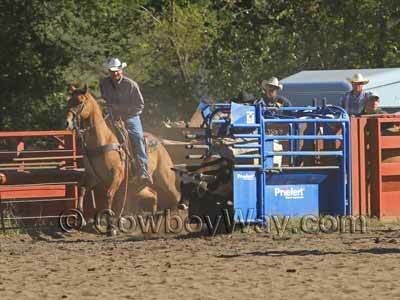 There are several reasons a roping dummy is a practical and far less expensive alternative for roping practice as opposed to live cattle. For example, a dummy is less expensive to purchase, never outgrows its job requiring it to be sold and replaced, and doesn't require additional costs like shelter, fencing, feed, or medical care. 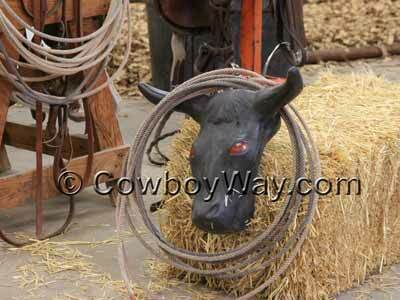 Below: A roping steer leaves the chute. Live cattle for roping practice require feed, care, fencing, (usually) a roping chute, and other expenses roping dummies don't need.